James van Riemsdyk highlighted a series of moves by former Toronto Maple Leafs players on Sunday to open NHL free agency, returning to the Philadelphia Flyers on a reported five-year, $35-million US deal. James van Riemsdyk highlighted a series of moves by former Toronto Maple Leafs players on Sunday to open NHL free agency. 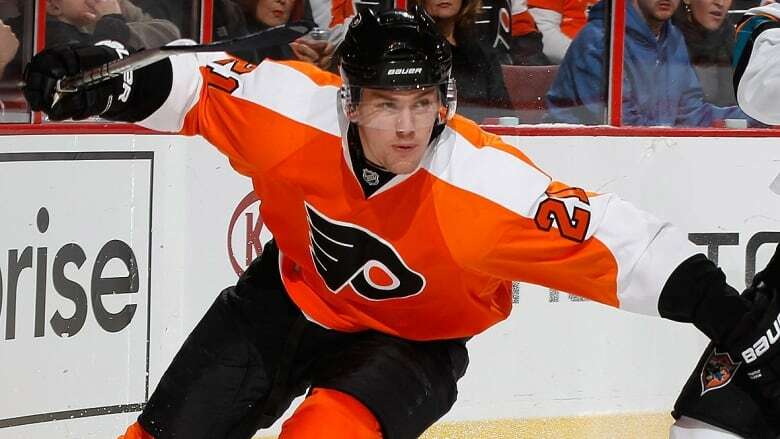 Fresh off a career-high and team-best 36 goals, van Riemsdyk is expected to return to the Philadelphia Flyers, who drafted the six-foot-three, 220-pound left-winger second overall in 2007. The 29-year-old's deal is reported to be five years and worth $35 million US. Van Riemsdyk finished fifth in Maple Leafs' scoring with 54 points this past season, the durable forward's sixth in Toronto and ninth in the NHL. The native of Middleton, N.J., has demonstrated a strong net-front presence in recent seasons and the ability to be a top-line forward with 201 points in his past 285 games. Van Riemsdyk broke into the NHL with Philadelphia in the 2009-10 season, scoring 15 goals and 35 points. He was traded to Toronto in June 2012 for defenceman Luke Schenn. Van Riemsdyk's former teammate Tyler Bozak joined the St. Louis Blues on a three-year, $15 million US contract. Bozak had 11 goals and 32 assists in 81 games last season. He had a career-best 55 points the previous campaign. Forward David Perron returned to St. Louis by signing a four-year, $16 million deal after setting career highs with 50 assists and 66 points last season with the expansion Vegas Golden Knights. St. Louis also signed former Sabres backup goalie Chad Johnson. The Vancouver Canucks have added three free-agent forwards to their roster, helping fill a gap left by the trio of veterans who departed last season. Centre Jay Beagle and left winger Antoine Roussel both signed four-year deals with the Canucks, who later added forward Tim Schaller on a two-year contract. Beagle and Roussel will receive an average of $3 million per year. Schaller will get an average $1.9 million annually. Roussel, 28, had five goals and 12 assists through 73 games last season with the Dallas Stars. As expected, veteran NHL centre Tomas Plekanec is said to be returning to Montreal a one-year contract worth $2.25 million after helping guide the Leafs to the post-season for a second consecutive season. The 35-year-old took time to settle in with Toronto after being acquired ahead of the Feb. 26 trade deadline, posting only two assists in 17 regular-season games while being a dependable player in the faceoff circle. Plekanec, who had a combined 26 points in 77 games with Montreal and the Leafs, added two goals and four points in seven playoff contests. He is two games shy of 1,000 in the NHL while Plekanec's 605 points rank 13th in Canadiens history. Montreal also signed free agent forward Matthew Peca to a two-year contract with annual salary cap hit of $1.3 million, and inked defenceman Xavier Ouellet to a one-year, one-way contract worth $750,000 in the NHL. The Calgary Flames tapped into the Carolina Hurricanes pipeline again, signing centre Derek Ryan to a three-year contract. The five-foot-11, 170-pound Ryan totalled 28 goals and 41 assists over the last three seasons with the Hurricanes. Flames general manager Brad Treliving swung a deal with Carolina at the recent NHL draft to get centre Elias Lindholm and defenceman Noah Hanifin in exchange for defenceman Dougie Hamilton, winger Micheal Ferland and college prospect Adam Fox. The Flames said Ryan's deal is worth $9,375,000 US. The 31-year-old from Spokane, Wash., had 15 goals and 53 points this past season with a minus-15 rating. Calgary also agreed to a two-year, $2.5-million contract with Austin Czarnik. The 25-year-old from Detroit compiled five goals and 17 points in 59 games for the Boston Bruins over the last two seasons. The San Jose Sharks have officially announced a eight-year contract extension worth $64 million US with centre Logan Couture. The deal signed Sunday begins in the 2019-20 season and keeps the 29-year-old Couture under contract in San Jose through 2027 season. The sides agreed to the deal Saturday but couldn't sign it until Couture entered the final year of his $30 million, five-year contract on Sunday. Couture was a first-round pick by San Jose in 2007 and has said he never wants to leave the franchise. The 29-year-old has 213 goals and 224 assists in 582 career games. He also has been a post-season standout, leading the NHL with 30 points in 2016 when he helped San Jose reach the Stanley Cup Final for the first time in franchise history before losing to Pittsburgh in six games. The Tampa Bay Lightning have signed defenceman Ryan McDonagh to a seven-year contract extension worth $47.25 million US. The deal begins with the 2019-20 season. The Chicago Blackhawks have signed goaltender Cam Ward, winger Chris Kunitz and defenceman Brandon Manning. The Buffalo Sabres filled a need at goaltender by signing former St. Louis Blues backup Carter Hutton to a three-year, $8.25 million deal. Minnesota Wild reached agreements to sign forwards Matt Hendricks and Eric Fehr to one-year contracts. The Detroit Red Wings have brought back left-winger Thomas Vanek on a one-year deal and signed goaltender Jonathan Bernier to a three-year deal. New York Rangers agreed to terms on a two-year, $8 million deal with restricted free-agent forward Vladislav Namestnikov. Veteran free-agent defenceman Jack Johnson has agreed to sign a five-year, $16.25 million deal with the Pittsburgh Penguins. Detroit Red Wings agreed to sign goalie Jonathan Bernier and Thomas Vanek. The 29-year-old Bernier signed a three-year contract after going 19-13-3 in 37 games with the Colorado Avalanche. Vanek signed a one-year, $3 million contract to return to the Detroit Red Wings, where he spent a portion of the 2016-17 season. Vanek opened last season with Vancouver and closed it in Columbus. Veteran Toronto Maple Leafs stay-at-home defenceman Roman Polak signed with Dallas while forward Miro Aaltonen, who was a key contributor for the American Hockey League's Toronto Marlies in their first-ever Calder Cup championship victory last month, reportedly has signed with Podolsk Vitjaz of the Kontinential Hockey League in Russia. Arizona Coyotes signed All-Star defenceman Oliver Ekman-Larsson to an eight-year contract extension that averages $8.25 million per year. Dallas Stars have signed free-agent goaltender Anton Khudobin to a two-year, $5 million contract as the likely backup to Ben Bishop. Pittsburgh brought back veteran centre Matt Cullen on a one-year, $650,000 deal and signed defenceman Jack Johnson to a $16.25 million, five-year deal. Former Winnipeg Jets netminder Michael Hutchinson has signed a one-year contract with Florida, and will be asked to provide depth behind Roberto Luongo and James Reimer. Carolina Hurricanes and goalie Petr Mrazek have agreed to a one-year deal worth $1.5 million after longtime goalie Cam Ward agreed to a one-year, $3 million deal with Chicago. Once the free-agency frenzy is completed, the focus will shift to ongoing trade speculation and negotiations involving teams attempting to lock up star players to long-term contracts. Those players include Sabres centre Ryan O'Reilly, Ottawa captain Erik Karlsson and Nashville defenceman Ryan Ellis.